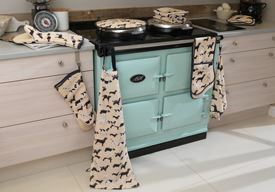 Here at AGA Cookshop we have developed a fabulous new range of kitchen textiles called Top Dog, incorporating our own innovative and classic designs that continually offer premium quality and maximum insulation. Many AGA owners will know their pets find prime position in front of the AGA where they find warmth and the hope of a stray morsel of scrumptious offerings from the cooker. The creation of the print has been inspired by our customers and their lovely dogs resulting in a beautiful, stylish and innovative print to use across our textile range. To learn more about our relationship with Dogs Trust, click here.